No one will suspect that this ordinary and fully functional smoke detector doubles as a hidden camera and a smoke detector. 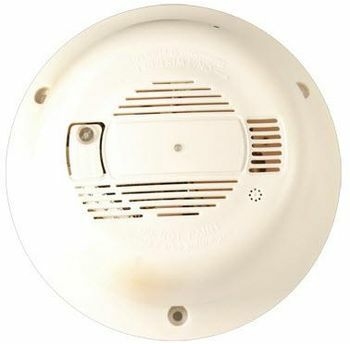 With no tell tale wires or visible lights, this ordinary looking smoke detector has no giveaway signs that it's really a full color CCD Hidden Camera. Wi-Fi capabilities let you easily view surveillance footage online in real-time. Capture professional grade security video, perfect for anybody hoping to catch criminals, vandals, or simply keep an eye on their assets and property. Our new Projector Alarm Clock Radio hidden camera and Wi-Fi transmitter is the perfect answer to any of your hidden camera or baby monitoring needs. This cutting edge spy camera features the very latest built-in Wi-Fi transmitting technology, allowing you to transmit the cameras video through your existing Internet connection for remote Internet viewing or recording from virtually anywhere on the globe! Please Note: The Wi-FI Smoke Detector Covert Camera is powered by plugging in a small AC adapter into a nearby outlet.